Yesterday was the Union Street Fair, San Francisco's closest thing to a Mardi Gras type event (women wearing skimpy halters, public intoxication and guys peeing in bushes). 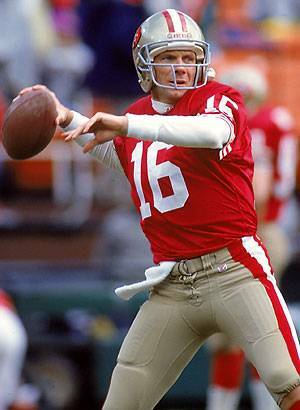 Just by dumb luck, my buddies and I got a table next to 49er legend Joe Montana at Perry's on the sidewalk in front of the restaurant (that has to be THE best seat for the Union Street Fair BTW). Me: "Dude, when I was at USC, I hated your guts!" Joe: "Hey, that's okay. You guys will be on probation next week"
Joe: (shrugged shoulders) "Can't wear 'em all the time! I need a break every once in a while." Me: "Don't worry, I won't tweet a photo of you in swooshes." Anyway, it was a pretty fun experience being at a big SF event with one of the biggest SF legends.